Thanks to the Heritage Beverage Dispenser from Anchor, you can turn your own dining room into a luxury hotel in a jiffy. And the best thing is, you get to decide what’s on the menu! This elegant glass jar has a removable lid - simply fill the jar with whatever takes your fancy and you’re done. It’s that easy. Just use the tap on the front to dispense drinks. The Heritage Beverage Dispenser is absolutely ideal for your next party. Imagine not having to run around all night ensuring your guests’ glasses are filled? Heaven! From DIY buffet breakfasts to parties and so much more – the Heritage Beverage Dispenser is a dream come true. Crafted from thick glass with a shiny chrome spigot tap. Simply turn the tap sideways to fill your glass. 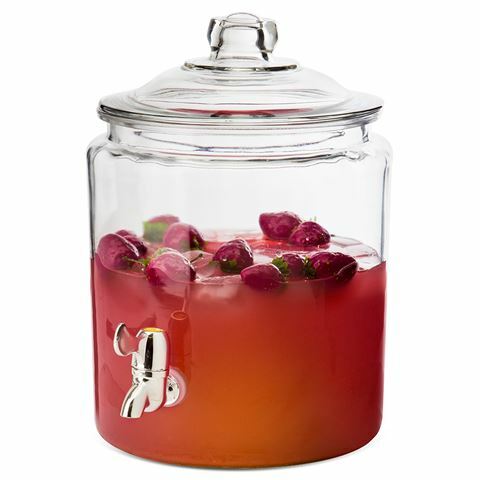 Removable lid at the top of the Beverage Dispenser allows for easy refilling. Diameter: 22cm (26cm including spigot tap).